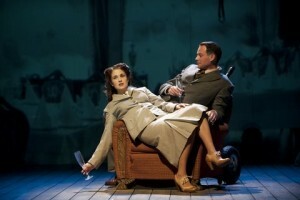 presents the Canadian premiere of Noël Coward’s Brief Encounter. Set in 1945, during World War II, the lives and loves of three couples are played out in a railway station tearoom where Laura Jesson and Doctor Alec Harvey have met by chance. Emma Rice’s concept employs an impressive array of theatrical styles and technical effects that switch seamlessly between theatre and film with live musicians on stage, characters jumping in and out of film screens, and much more. Noël Coward’s Brief Encounter quite literally has to be seen to be believed. Featuring such Noël Coward songs as Mad about the Boy, Any Little Fish and A Room with a View it will be fun for the whole family. Noël Coward’s Brief Encounter stars an ensemble of actor/musicians, all but two making their Playhouse debuts: Rachel Aberle (Playhouse debut) as Beryl/Waitress/Dolly; Mairi Babb (Playhouse debut) as Laura Jesson; Eric Blais (Playhouse debut) as Dr. Alec Harvey; Steve Charles (Playhouse debut) as Bill; Lucia Frangione (Playhouse debut) as Myrtle/Margaret; Charlie Gallant (Dangerous Corner) as Stanley; Jonathan Holmes (Playhouse debut) as Albert/Fred; Alison Jenkins (No Great Mischief) as Musician; Blair Northwood (Playhouse debut) as Bobbie/Johnnie. Tickets can be reserved by calling the Playhouse Box Office at 604 873 3311, on line at vancouverplayhouse.com or in person at the theatre box office at Hamilton & Dunsmuir (Mon.-Fri., 10am-5pm). Tickets range from $49-$79 for Adults.